I’ve been going to CRSSD Festival since its inception and each edition never ceases to amaze me. 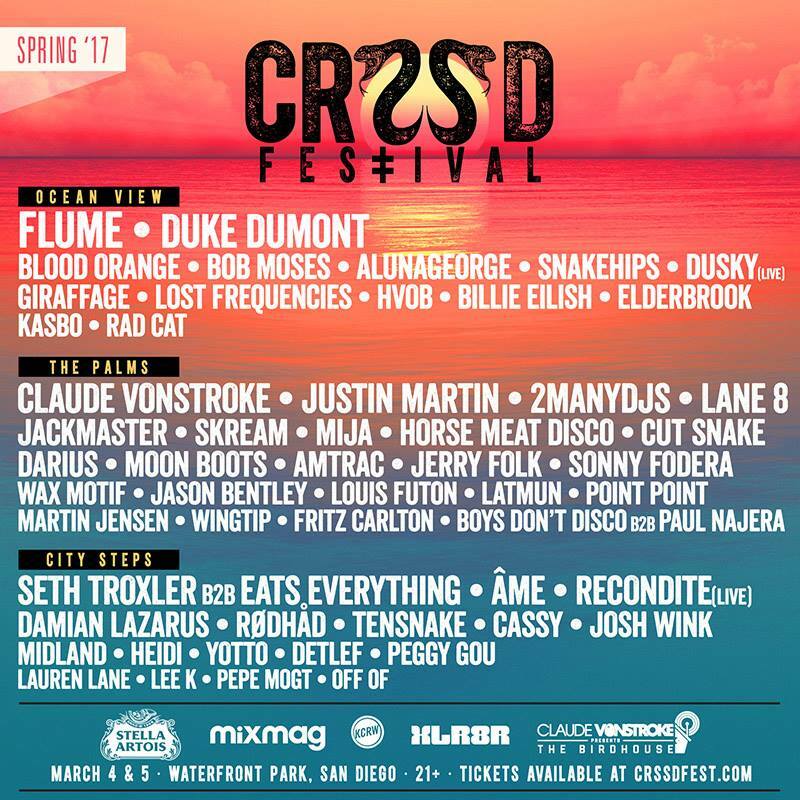 This week the festival organizers announced the full lineup for CRSSD Spring 2017, happening March 3rd and 4th at San Diego’s Waterfront Park, and I’d have a hard time curating a better lineup in my dreams. CRSSD is known for its underground vibes – full of House and Techno – with a splash of live and big-name touring acts. Each of the three stages are curated in a way that you know what types of sounds to hear at each: live or full-band performances at the “Ocean View” stage; Deep House and Techno at “City Steps”; and Booty Bass and Funk over at “The Palms”. I’ve had amazing times at each stage, though I am slightly biased towards the funk of The Palms combined with its lush green surroundings. Beyond the excellent lineup for any House or Techno lover, the festival overall is meant for the adult music enthusiast who likes the finer things in life. You get to party in the warm sun of San Diego when the rest of the country is buried under snow, it’s 21+ which means you don’t have to watch out for teeny boppers, it’s only two days which means you don’t have to commit to nearly a week of partying or vacation time (let’s face it PTO is a thing), and there’s fantastic food, drinks, and smiling faces everywhere. Latmun – dude is just having a monster year. Every song he puts out is a banger and Lee Foss alone played 4-5 of his songs in his CRSSD October set this past year. Damian Lazarus – after attending his Day Zero party in the Mayan jungle of Tulum a few weeks ago, Damian has solidified himself in my mind as a visionary and a magician. His sunset set last year was fantastic and I can only imagine what he has in store for us this year. Cut Snake – after seeing these Aussies tear it down at Snowglobe last year, and hearing their new mixes and music this past year, there’s no doubt they’ll bring the heat. If you haven’t checked these guys out, do yourself a favor. Moon Boots – close friend of the blog, Peter has a very unique style of House music that he plays. It’s soulful, it’s bouncy, it’s seductive. I never miss a chance to see Moon Boots in action. Sonny Fodera – one of my favorite producers and DJs in the past year, I somehow have missed every opportunity to see him live. The proof is in the pudding… now I just need to dance my way through it. Seth Troxler b2b Eats Everything – Seth Troxler has been going b2b with everyone recently, most notably with Loco Dice AND The Martinez Brothers at BPM Festival. Always excited to hear what he has in store and how he tweaks his style based on who he’s spinning with. And Eats Everything is just a legend, so…. Point Point – these French dudes throw down a different vibe than your “traditional” Palms Stage sound but I’m okay with that and need to see what their live show really entails. All I know is their productions rock! Next ArticleFelix Jaehn Starts Off His 2017 Tour at Bang Bang!